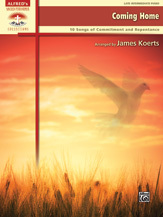 This reflective solo piano collection is appropriate for times of silent prayer. The meditative arrangements are both calming and inspirational. Titles: Have Thine Own Way, Lord * I Have Decided to Follow Jesus * I Surrender All * Is Your All on the Altar? * I Will Follow (Medley) (Where He Leads Me, I Will Follow / Take My Life, and Let it Be / Footsteps of Jesus) * Just As I Am, Without One Plea * Lord, I’m Coming Home * Search Me, O God * Softly and Tenderly Jesus Is Calling * Whiter Than Snow.